Si vous cherchez la version française de cet article, elle est ici : Panorama des médias sociaux 2015. Seven years ago, I created a small diagram to illustrate the variety of existing social platforms, the Social Media Landscape was born! From the moment I published it, I began to witness connections from across the globe and started receiving messages from an incredibly broad crowd (journalists, authors, teachers…). Since then I published a new version of this landscape (nearly) every year: 2009, 2011, 2012, 2013 and 2014. We are now in the middle of 2015, and it is time to unveil the latest version of this diagram. Does this landscape deserve a new version every year? Absolutely! The average internet user won’t probably notice it, but online social media is an ever evolving field, with tons of evolutions, new features, ins and outs. This is what this landscape is about: providing you with the most accurate vision on a yearly basis. Google’s social platform has been in the center of my diagram for several years, but despite tremendous efforts, Google+ never really caught-up. There are numerous reasons for this failure, one of the most obvious one is that they launched their social platform years after Facebook, Twitter… As everyone will tell you: « why changing when it is not broken?« . Google made the announcement three months ago (Google+ officially splits into Photos and Streams) and we begin to see the result with the launch of Google Photos and the disappearance of profile links. Live video streaming services made a lot of noise during the SXSW festival, Meerkat was the first one, but Twitter decided to bet on Periscope. In order not to drown into a sterile debate, I added booth. Unless you’ve decided to follow a digital detox program, you probably have noticed how GIF has became a huge part of the social web. There are countless GIF hosting services, but Imgur is probably, by far, the most popular one. Another category which gain enormous traction is professional communication / collaboration social platform. Microsoft, IBM, SalesForce… all tried to prevail this category, but Slack seems to be THE ultimate enterprise social tool. So it is, I also added the aforementioned one because they are legitimate contenders. 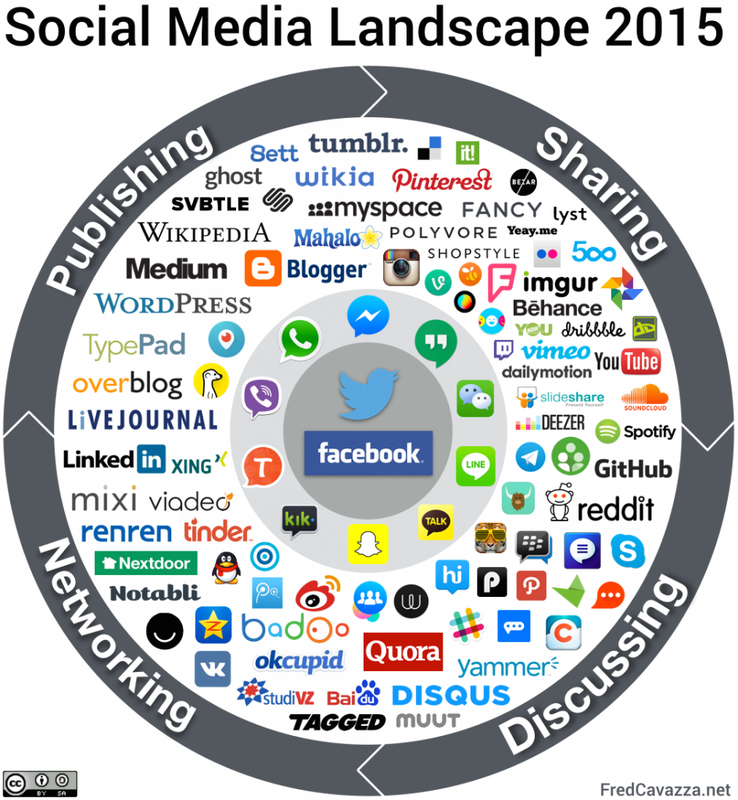 As you can see, social media is a vast ecosystem of online services structured around four main usages: publishing, sharing, discussing and networking. These four usages are not exclusive, since services like Tumblr allow members to fulfill various objectives (publish, share, discuss…). At the center of this ecosystem, we find Facebook and Twitter. Not that this two social platforms are better than the others, but they managed to sit at the far end of the chain and gather all social interactions occurring inside this ecosystem. To be more accurate, Facebook and Twitter allow users to fulfill each of the four main social usages, but they also stand as relay. At the center of the diagram, we will also find mobile applications. Applications like WeChat, Line, Messenger, Hangouts, WhatsApp, Viber, Tango, Kik, Kakao Talk and Snapchat where « simple » communication tools when they started, but they have evolved into much more sophisticated social objects adding more and more functionalities. Today, they stand for one-stopping-shopping apps, trying to be the digital Swiss knife in your pocket, allowing users to do various tasks from ordering a taxi, to playing games, to reading entire articles, to exchanging money with friends, to shopping online goods (Facebook’s Messenger Platform Must Go Beyond Apps And Embrace The Web). Networking with B to C social networks (Tagged,Nextdoor, Notabli, Ello, Qzone, VKontakte, RenRen, Mixi, StudiVZ…), BtoB social networks (LinkedIn, Viadeo, Xing), dating services (Badoo,OKcupid…) and their mobile counterparts (Tinder, Skout). I acknowledge this is a complicated diagram with a lot of logos, but it illustrate the variety and density of the social media ecosystem, and it’s far from being exhaustive! If you are looking for alternative diagrams, I shall recommend the Conversation Prism, the World Map of Social Network, the Guide to the Social Landscape, the Social Media Map or the China Social Media Landscape. I hope you will find this diagram helpful, feel free to use and share it (by respecting the Creative Commons terms. If you have any remarks, or like to raise the attention on a particular unmentioned social platform, do so in the comments or email me.